In 2011, an independent panel was invited to make recommendations to the government regarding the future direction of forestry and woodland policy in England and it was here that Grown in Britain was created. The resulting report – Recommendation 18 – urged the Government, woodland owners and businesses to work together to unlock the benefits of British timber in their supply chains. In a bid to combat the deceptive use of the British flag on timber products across the UK construction sector, GiB are rolling out a campaign, starting with a newly-released infographic putting the facts in the spotlight. Dougal commented: “As shown in our new infographic, the UK imports £7.8bn of foreign timber every year, whilst we rarely add any significant value to our home-grown sawn timber supplies, and half of our broadleaved and mixed woods are unmanaged. 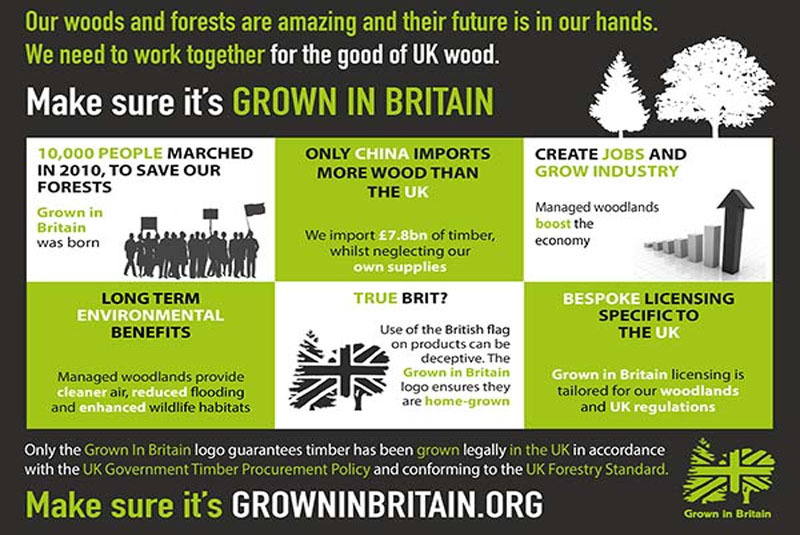 For more information or to enquire about licensing, visit www.growninbritain.org or call 0117 958 2189.